Should I pick this partially ripe Brandywine Red? Do your heirloom tomatoes crack and get moldy before you think they’re ripe enough to pick? Do your cherry tomatoes all but split before your eyes the day after it rains? Do brown marmorated stink bugs and birds start eating your ripening tomatoes before you do? Then read on to learn what I’ve just learned—and maybe your heirlooms will split and mold less, you’ll harvest your cherries before they split, and you’ll eat more of your tomatoes before the stink bugs do. When I picked tomatoes for 10¢ a basket as a teenager in southern New Jersey, farmer Joe Uhland set the picking rules: the red fruit must be fully ripe and without major blemish or piece of stem—or the canning company would downgrade the load and Joe would be paid less. For nearly 60 years since Joe set the standard, I’ve been picking tomatoes when they’re fully ripe. This bit of ancient wisdom, however, got a jolt last Thursday when I was researching on the Internet about the effect of extreme heat on tomatoes. I discovered a posting that directly challenged my belief that I should pick only fully ripe tomatoes. I laughed out loud when I read it. I was astounded—but it made sense. 4. Pick tomatoes at “breaker stage” and you can let them ripen slowly in a cool place—minimum of 50°F—or more quickly at higher temperatures—up to 85°F—( such as on your kitchen counter.) They will not ripen in your refrigerator (where the temperature is below 40°F). 1. 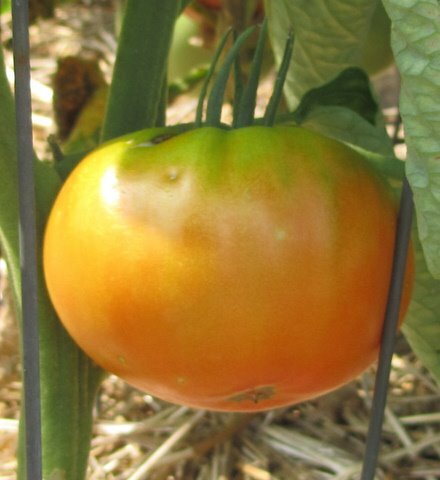 In extreme hot weather, some red-tomato varieties stop making red pigments at about 95°F, so the fruit can be fully mature when it’s yellow-red. If you wait for the fruit to turn deep red, the fruit may begin to spoil before you decide to pick. 2. Some large-red varieties, including many heirlooms, tend to split when near ripe and often begin to mold or have other problems. If you pick them before they reach this problem stage, you will harvest better quality fruit. This has happened already this season in the Tomato Patch. A gnarled Brandywine Red split at its blossom end before it was fully ripe and began to mold. I tried to salvage some of the ripe fruit but had to discard most of it. Picking early may avoid the splits and the mold. 3. Many cherry tomato varieties are known to split—and begin a quick decline in quality—after it rains. One of my favorites, Sungold, does that regularly. It rained here Monday afternoon, and by Tuesday morning many of the ripening Sungolds already had split. Picking early may avoid such splits. 4. I admit I sometimes don’t know when the fruit of a particular variety is fully ripe. I grow Brandywine (Sudduth’s Strain) and often wonder how “pink” the fruit must be to be ripe. And how do I know when a Virginia Sweets is ripe? It’s described on its seed packet as a gold-red bicolor and a “golden yellow beefsteak … colored with red stripes that turn into a ruby blush.” Picking early may help me monitor the fruit as it ripens on our kitchen counter. 5. Think of all the critters that like to dine on tomatoes, from insects, such as the tomato-sipping brown marmorated stink bug, to traditional harvesters such as birds, squirrels, and the occasional box turtle. Picking early may mean I will enjoy my tomatoes more than they will. Should I put so many tomatoes in one basket, so to speak, just because one posting by one horticulturist says I should pick earlier? I’m “three score and 10 plus” years and still learning new things about picking and growing tomatoes, but perhaps that challenges of gardening what makes it so attractive, even to ancient gardeners. I’m going to start experimenting by picking “breaker stage” tomatoes, and I think you should too. If you do, be sure to come back and Comment about how it works for you. If you want to read the Kansas State University posting, “Harvested Tomatoes Can ‘Vine-Ripen,’” CLICK HERE. I grow my tomatoes in a community garden full of squirrels (and rabbits!). I was told to harvest as soon as they began to blush, and haven't been disappointed by that. It's when I miss a tomato, get excited, and then turn it around to see the squirrel bites that I get really sad. Great! Looks like a lot of gardeners are picking tomatoes at breaker stage–and are enjoying their pickings more than the critters are eating! Go, gardeners! I discovered last year to harvest early to avoid stink bug damage. It worked for me without compromising taste. So I have continued to do the same this year and noticed that our yield is larger. Thanks for sharing the affirmation. I grow my tomatoes up chicken wire secured to fence posts. The vertical growth makes it easy to keep fruit above the level of most bugs and rabbits. It also makes it easier to find bugs and caterpillars for removal. And of course, it is also easier to see the color of ripening fruit. Thanks for this reminder to pick the fruit at breaker stage. We thought this was the answer, but reading it gives us more confidence in doing so.